With the offseason now long gone, it’s finally time for meaningful New Jersey Devils hockey. The Devils are in a much different place than they were at this time last year. Most experts had them pegged for a lottery spot in the Entry Draft. Instead, they defied expectations and finished with the most wins (44) they had in six seasons. While the organization had plenty of cap space, general manager Ray Shero stayed quiet in free agency, opting to improve the team from within its prospect pool. The lack of signings caused frustration among fans, especially after a surprising run to the postseason. Despite the quiet offseason, there is a lot to look forward to for the upcoming season. They also face some questions. Can their defense hold up? 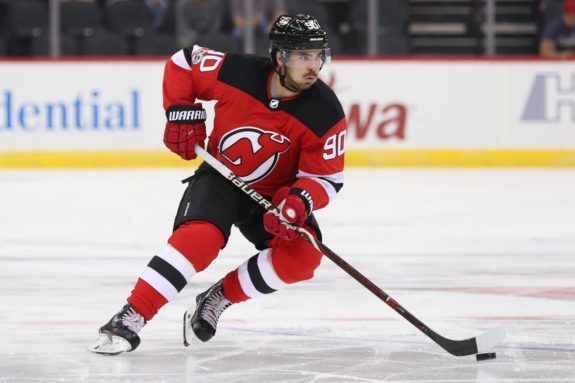 Will Nico Hischier and Jesper Bratt take another step forward? Can Marcus Johansson stay healthy? Is this finally Pavel Zacha’s breakout season? That gives the team plenty of interesting storylines as the season begins. 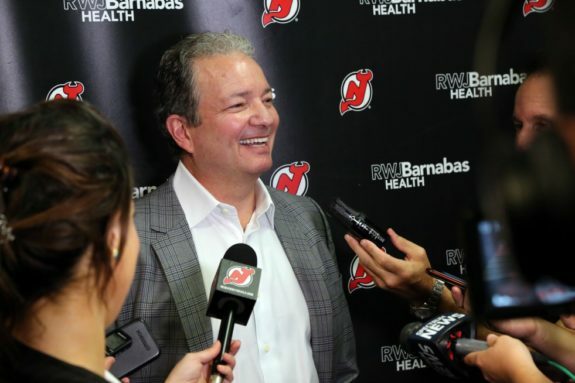 The core of Devils management returns, with Shero entering his fourth season as the Devils’ general manager. Tom Fitzgerald also returns as assistant general manager and will continue to be in charge of the Binghamton Devils. The most notable change to the front office was the addition of Chuck Fletcher, who joined the Devils as a senior advisor to Shero after he was let go by the Minnesota Wild. John Hynes returns for his fourth season as Devils head coach, but there are a couple of changes to his staff. Geoff Ward, who was in charge of the team’s power play, left for an assistant job with the Calgary Flames. 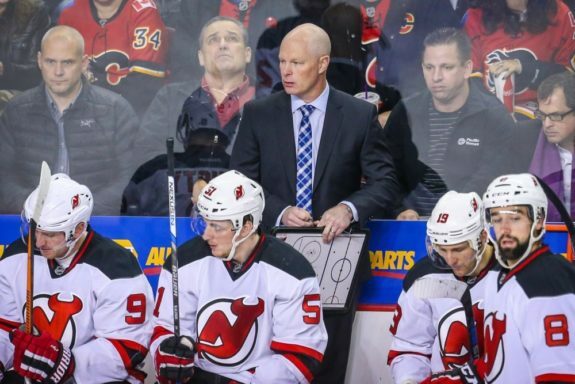 Replacing him is Rick Kowalsky, who spent the last eight seasons as the head coach of the Devils’ AHL affiliate. The Devils also added former NHLer Mike Grier to their coaching staff. Grier spent the past four seasons as a scout for the Chicago Blackhawks. For the Devils, he’ll operate as their eye in the sky for each game. This will be Grier’s first job as a coach since retiring from the NHL in 2011. With Kowalsky moving up to the NHL, the Devils hired Mark Dennehy to take over as the head coach in Binghamton. He was hired just two months after he took a job with the Pittsburgh Penguins organization. Prior to that, he spent thirteen seasons as the head coach of Merrimack College in the NCAA, where he coached Devils’ prospect Brett Seney for the last four seasons. Johansson is a key player for the Devils. He missed all but 29 games of 2017-18 due to injury, that included two concussions. He had a full summer of training and had no lingering effects from either head injury. With him back to full health, he’ll have a big say in helping the Devils find secondary scoring. From 2014 through 2017 with the Washington Capitals, Johansson averaged 52 points per 82 games, so there’s no doubting he can score. He also had a positive impact on the team’s shot rates. As a second-liner, that’s what you want to see. And that’s what the Devils hope he can provide now that he’s fully healthy. It may be now or never for the former sixth overall pick. In two seasons with the Devils, Zacha has tallied 51 points in 140 games. 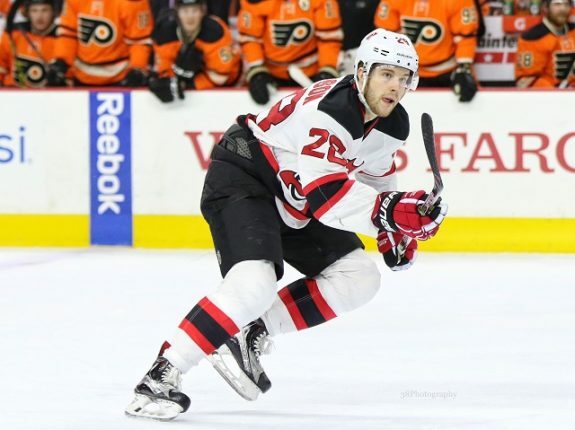 He’s going to start the season as the team’s second-line center, so the Devils will need more offense from him. Zacha only finished with four shots on goal during the preseason. But that doesn’t mean he wasn’t shooting the puck more often. He had 12 shot attempts in all situations, which put him one ahead of Hischier. If he continues to shoot the puck more often, he should be able to start racking up more points. Wood was absent from the start of camp but returned with just enough time to get in some game action. He played in one game and picked up right where he left off in 2017-18. He created more than a few quality scoring chances and shot the puck at a high rate. The Devils know what they’re going to get from players like Hischier and Hall. It’s what they get from their rest of their scorers that remains a bit of a mystery. Wood — like Johansson and Zacha — will play a key role in solving that mystery. He isn’t going to be the team’s leading scorer, but Wood is capable of putting up points. He’s a high volume shooter and creates a ton of quality scoring chances. 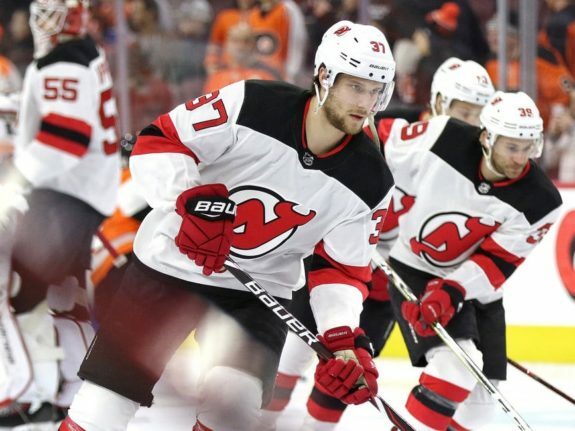 He’ll start the season with Travis Zajac and John Quenneville, which should give the Devils a pretty effective third line with some scoring punch. 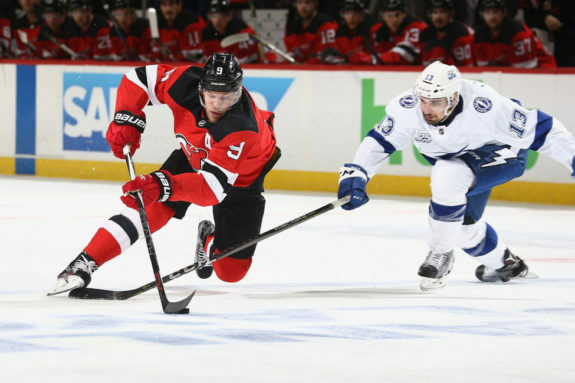 After a disappointing 2017-18, Severson is looking to bounce back and play a top-four role for the Devils. He finished last season with 24 points in 76 games but was a healthy scratch on a few occasions after failing to meet expectations. 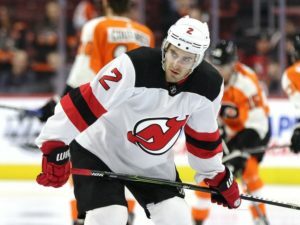 With John Moore having departed for the Boston Bruins in free agency, the Devils need Severson to step up. The good news for Severson is that appears he’ll be paired with Andy Greene. The two played together in one preseason game and had positive results. Their history as a defense pair goes back a few seasons, too. Since 2015, they’ve played over 700 minutes together and have a 50.4-percent CF%, as well as a 2.9-percent relative Corsi For (Rel CF%). The positive results bode well and could help give the Devils more balanced defense pairs. Based on the preseason, Mueller appears bound for first-pair minutes. He spent most of the preseason with Sami Vatanen, and Hynes seems intent on keeping him there. Even though that spot is his, Mueller may have a short leash. In three preseason games, the Devils had a 41.05-percent CF% and were out-chanced 24-10 with him on the ice. If he’s going to play alongside Vatanen, he’ll be logging some of the hardest defensive minutes. Those numbers are going to have to be much better for them to have success. We’ll see how long the Mueller/Vatanen pair holds up, but I wouldn’t hold my breath on it being a long-term solution. Mueller was a depth defenseman last season and had a generally poor preseason. I imagine Hynes will mix and match his pairs before finding the right fits. 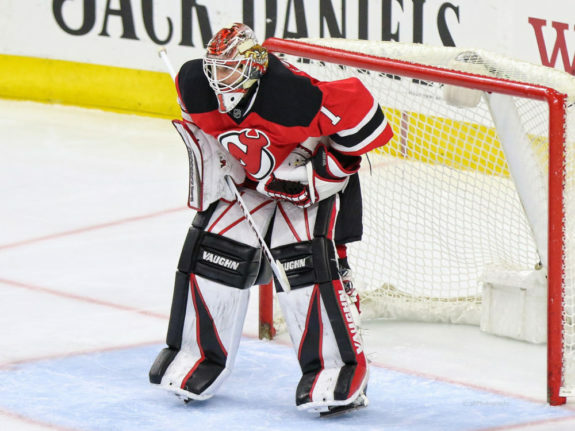 The Devils have a bit of uncertainty in net heading into the season. Schneider continues to rehab from offseason surgery and appears close to returning. How he performs when he returns remains a big question. He’s been a below league average goaltender in each of the last two seasons. The Devils we need him to be better to contend in the Metropolitan Division. In the meantime, Keith Kinkaid will take control of starting duties. Kinkaid was stellar in the second half of 2018-19. If he hadn’t performed the way he did in his last 20 starts, the Devils would have missed the playoffs. He’ll need to get off to a strong start until Schneider returns to action. Serving as Kinkaid’s backup will be Eddie Lack. The Devils should be happy with the way he played in the preseason. He started in two games and posted a .956 save percentage (SV%) at 5-on-5. If Kinkaid struggles or needs a night off, the team should feel comfortable giving Lack some starts. If Zacha is going to have a breakout season, 2018-19 may be the year. He had an encouraging preseason and will have two skilled players on his wing in Bratt and Johansson. They showed chemistry together and have the potential to be a productive second line. Zacha began to show some signs of improvement towards the end of last season, too. He produced at a 38-point-per 82-games pace over his last 30 games and averaged 1.67 points per 60 minutes (P/60) at 5-on-5. Those are numbers the Devils would like to see from him as a second-line center. The Devils drafted Zacha with the hopes of him turning into a top-six forward. He hasn’t produced like one yet, but he has the tools to do so. He’s already a more than capable defensive forward. If he finds some offense, it wouldn’t be unreasonable for him to finish with 40-plus points in 2018-19. Johansson has proven that he’s a quality forward in his time in the NHL. While that’s the case, he still has a lot to prove as a Devil. Injuries, to no fault of his, hampered his 2017-18. The key for him will be maintaining his health. He was the victim of some unlucky breaks last season, so he’s due for a turn of luck. If he stays healthy, he’ll be an important part of the Devils’ top six. He’s also in the final year of a contract that paid him just over $4.5 million a season. If he becomes a victim of the injury bug again, it’ll hurt his free agent stock and may force the Devils to let him walk next summer. Considering they gave up a second and third-round pick in 2017, that would be a less than ideal situation. The Binghamton Devils enter 2018-19 with a much deeper group of forwards than last season. Leading the list of potential early season call-ups is Brett Seney, who had a strong preseason with the team. He posted decent results at five-on-five and was among the team’s final cuts. If there’s an early-season injury, he should be the first call-up to the NHL. The next choice should be Nick Lappin, who was Binghamton’s leading scorer in 2017-18. The second tier of potential call-ups depends on how they perform in the AHL. One of those is Joey Anderson, who is one of the Devils’ top prospects. If they need someone to fill a bottom-six role, he could get the call-up. Michael McLeod, Blake Speers, and Blake Pietila can also earn call-ups if they play well. Unlike their forwards, the Devils lack defensive depth in the AHL. 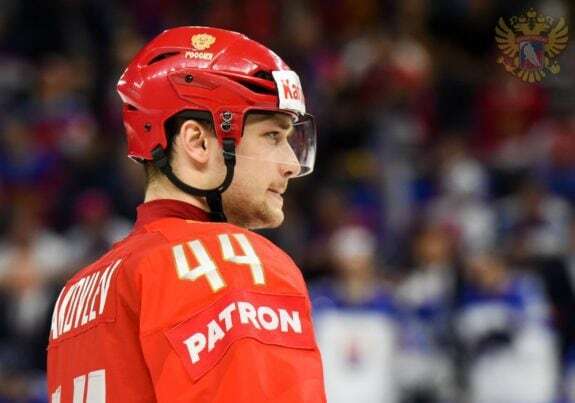 The most likely choice for a call-up would be Egor Yakovlev, who they signed as a free agent from the KHL during the offseason. He struggled a bit during the preseason, especially on defense. But he does have some offensive ability that should prove useful. Yakovlev was caught a bit off guard by his demotion but says he’s ready for the challenge. “It was a surprise for me. But I was told I have to adjust and it takes time, so I’m OK with that. I’m not going to go home, I want to prove I belong to the NHL,” Yakovlev told Igor Eronko of Sport-Express. After Yakovlev, it’s slim pickings for the Devils if they need a call-up on defense. Josh Jacobs has been in the organization for a couple of seasons, but it doesn’t appear he’s ready for NHL action. Colton White is another candidate, but like Jacobs, he needs more time in the AHL. That could make for a tricky situation if the Devils need more than one call-up. The Devils are in one of the most competitive divisions in the league. There are at least six teams that can compete for a playoff spot: the Philadelphia Flyers, Columbus Blue Jackets, Washington Capitals, Carolina Hurricanes, Pittsburgh Penguins, and the Devils. The Devils defied the odds last season and qualified for the playoffs for the first time since 2012. The odds are against them once again, as plenty of experts have them due for some regression. It also doesn’t help that they had a quiet offseason, while teams like the Hurricanes and Flyers made significant upgrades. Although the calls for regression are justified, there are reasons to be optimistic about the Devils. They still have Taylor Hall, who was the league’s MVP in 2017-18. Young players like Hischier, Bratt, Wood, and Zacha should take another step forward, while Quenneville should add some more offense. The Devils’ main question marks are on defense and in net. If Schneider returns from injury but is still performing below league average, they’re going to have some problems. It won’t help matters if Kinkaid gets off to a slow start, either. If their goaltending and defense hold up, the Devils should have a good shot at the playoffs. Most of their key players return on offense, and they have depth on all four lines. They probably won’t finish with 97 points again. But they should be able to crack 90-plus and contend for one of the wild-card spots in the Eastern Conference playoffs.